I have long intended to write more about how to customize my FileMaker-based Studio Manager product. I thought I would blog about FileMaker and use simple examples from Studio Manager along the way. First off, are some essential FileMaker resources at your disposal. Studio Manager is about 99% unlocked. It is targeted towards firms and individuals who want to shape their mission critical software, at least to some extent, to their own unique needs. To get the full value out of any FileMaker-based product (that is not locked up tighter than a drum), you need to get your hands dirty and learn a little FileMaker. When I made a mind map on the subject of customizing Studio Manager, the first thing I noticed is that fully 80% of the topics were simply FileMaker basics. I realized that it makes no sense for me to duplicate what is already in the 108-page FileMaker 8 User Manual that comes in the box. 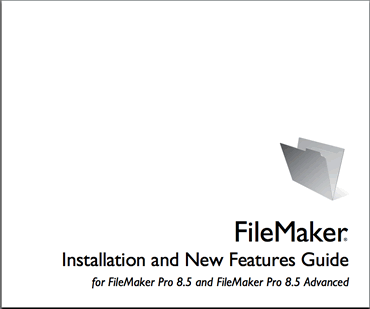 By the way, even though FileMaker Pro 8.5 is a $100 upgrade to FileMaker Pro 8, it is still FileMaker Pro 8 and therefore, the user manual is a guide to FileMaker Pro 8, not 8.5. FMI provides a one page listing of 8.5’s new features in the installation guide (see cover below) but the informational meat about FM 8.5 is in the online help. 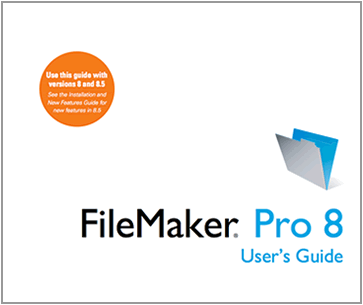 Attention Beginners: you gotta check out and use the FileMaker Pro 8 User’s Guide if you want to take charge of your database and make it do your bidding. I am going to slant this series towards people who have purchased a FileMaker Pro 8.5 template or who have chosen to use one of the free FileMaker templates that come in the box. Now is the time to crack open the user manual and learn a little bit about FileMaker. There is a great little overview of FileMaker on pages 9, 10 and 11 that will give you a thumbnail sketch of what FileMaker can do. The bottom of page 11 and all of page 12 tell you what is new in FileMaker 8 which is of interest if you are upgrading from a previous version of FileMaker. This is a well-produced manual. The pages are horizontal, 6“ x 9” with two columns. Very readable and friendly. Every time I cover something related to this manual, I will give you a page reference so that you can get the straight scoop from FileMaker. And then I will embellish, provide examples and apply the basics. I will provide the real-world portion based on my 20 years of FileMaker customizing experience. When you buy FileMaker, you get a full pdf of the user manual too. It installs automatically when you install FileMaker if you choose the default install. Two cool things about a PDF, (1) you can get to it without getting up and finding your manual and (2) it is great if you have lost your manual and (3) it is searchable by keyword. I should mention another resource in case you are not aware. FileMaker Inc. is currently giving away an introductory ebook on FileMaker Pro 8.5 when you buy a copy of FileMaker. 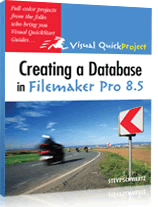 It is called: Creating a Database in FileMaker Pro 8.5 and is a Visual QuickProject book. What is cool about this book is it is totally hands on. You are led step-by-step through a FileMaker project. This is a great way to get yourself over the hump of actually using FIleMaker as a casual developer. Highly recommended. By the way, Amazon is selling FileMaker Pro 8.5 with free shipping for $268.99 as of this writing. You can get the ebook this way too. The free ebook deal expires on June 21st and does not apply to upgrades. For details. You can see and read some book excerpts on O’Reilly’s book page by clicking the Start Reading Online button. If you have been tasked with entering data into a FileMaker database to perhaps enter all your company contacts and that is all you plan to do, you do not need these references. Just get a 15-minute briefing about the specific entry screen and data you need to enter and be on your way. Otherwise, you are going to benefit greatly from these information sources. If you are already advanced, chances are you are more committed to learning FileMaker and even though you will know quite a bit of what is in these resources, there is always that tidbit now and then that will make the reading worth your while. Read for your type of use or development and skip over what doesn’t interest or apply. The Online Help. Don’t forget the online help when you have FileMaker already fired up. Sometimes, if you have a big screen, it is easier to just have the online help open beside your database and use it there when you have a question. Just type Cmd-? 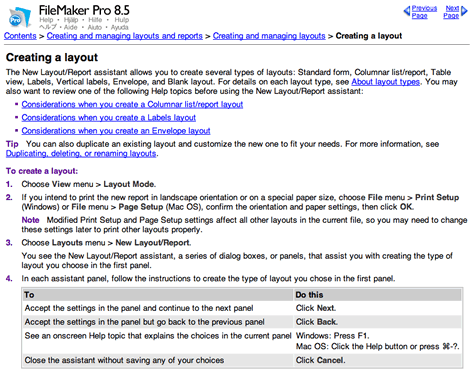 or choose FileMaker Pro Help from the Help menu. Beginners should click the first link called FileMaker Pro Basics and go from there. FileMaker’s online help is an invaluable reference. It greatly exceeds the printed user manual in the depth of its coverage. These introductory comments are just the tip of the iceberg on this topic. I intend to talk about creating and modifying layouts very soon. Perhaps by the time you read this, you will see several other posts in this series. Our goal for the Studio Manager product is to create an entire little manual on customizing Studio Manager. These blog posts are intended to be chunks of content that will go into our customizing manual. We just didn’t want to wait until the whole manual was done to get the information out to you. As my fellow developer and creator of FileMaker Magazine, Matt Petrowsky, says, happy FileMaking! This entry was posted in FileMaker 8, FileMaker Resources on April 5, 2007 by janet.